Opened in 1976, Club Med Cancun Yucatan was one of the first all-inclusive hotels to launch in Cancun. It also catered to affluent adults; in fact, it operated as an adults-only resort for several decades. Times have changed, just a bit. In 2005, the resort closed after it was devastated by Hurricane Wilma. 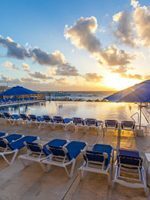 When it reopened in 2006 — following $20-million enhancements — Club Med Cancun Yucatan began to welcome families with the brand’s signature Mini Club, Junior Club Med and Passworld Teen Club. 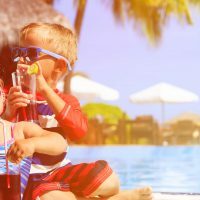 In 2014, the resort completed another renovation — this time to the tune of $14 million — bringing with it 60 Family Suites, accompanied by a new playground; Petit Club Med, the chain’s signature program for toddlers; Maya Lounge, with new entertainment; and La Estancia, an Argentinian restaurant. Visit Club Med Resorts for more information about the brand, which offers more than 65 resorts worldwide. All guestrooms offer air-conditioning, coffee machines, in-room safes, mini-fridges, hairdryers, irons and ironing boards, and phones. They also offer desks which double as vanities -- simply flip the mirror up to make it a vanity or down to designate it a desk. Note: Toiletries, -- such as shampoo, body wash, lotion, shower caps and cotton balls -- are provided, but conditioner is not; be sure to bring your own. 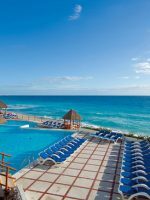 In 2014, Club Med Cancun Yucatan welcomed the addition of Aguamarina -- an oceanfront building with 60 Family Suites in two categories: Club and Deluxe (30 of each). It also welcomed a new playground, adjacent to a series of tennis courts next to the building. Family Suites feature balconies or patios with comfy loungers and outdoor showers -- perfect for rinsing sand off little fingers and toes. Rooms on the first floor also include heavenly outdoor cabanas, just steps from the beach. 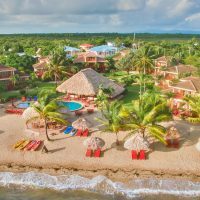 Because Aguamarina is located a short distance from some of the resort's main facilities, this also provides families with peace and quiet at night (though you'll still be able to hear music in the distance on select nights). Club Family Suites are 538 square feet in size and sleep up to six people in one king bed, one sofa bed and two twin beds. The twin beds (which can be connected) are housed in a separate bedroom for kids, while the king bed and sofa bed are located in a master bedroom -- both beds can be privatized by a curtain. Bathrooms are large enough to be separated into three spaces, with a room for the toilet, another for the shower and bathtub, and another for two sinks. Deluxe Family Suites are very similar (though larger at 678 square feet), except they offer two full bathrooms. In the suites, the area with twin beds has a private shower-bath combination, plus a sink. Just outside the bedroom door, there's a small room with a toilet. The large bathroom found in Club Family Suites is the same in Deluxe Family Suites. These rooms are designed in four variations: Deluxe Room 5 Trident Space, Deluxe Two Bedroom 5 Trident Space, Family Suite 5 Trident Space and Suite 5 Trident Space. The Family Suite 5 Trident Space is a spacious choice for families -- it spans 720 square feet. Plus, all Suites 5 Trident Space Rooms feature continental breakfast, laundry service (additional fee), turn-down service, bathrobes and slippers, mini bars (restocked daily), deluxe toiletries and priority housekeeping. 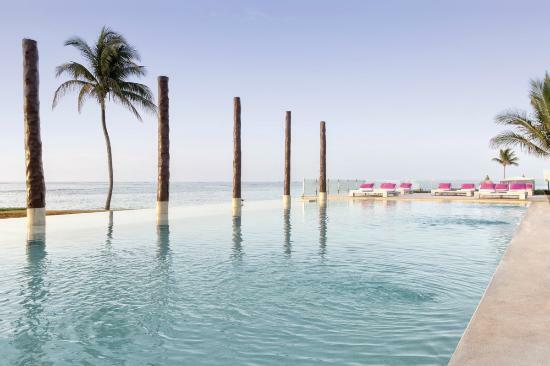 Jade offers exclusive features to guests, such as an infinity pool, private cabanas, and a pool bar. Deluxe Rooms include Deluxe Room Oceanfront, Deluxe 2 Bedroom Oceanfront and Deluxe Family Room Oceanfront. Some have connecting capabilities, and all include nightly turndown service, bathrobes and slippers, deluxe toiletries and welcome amenities. Deluxe Rooms also have mini bars. 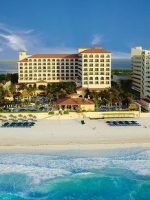 This group encompasses six designs, including accessible accommodations: Club Room Ocean View, Club Room Private Terrace Sea View, Club Family Room Oceanfront, Club Room, Club 2 Bedroom and Wheelchair Accessible Club Room. These are ideal for families (especially multi-generational travelers), as many units can be divided into two bedrooms. Mini-fridges are also available upon request. Finishing up an fantastic week at Club Med Cancun. I had not water skied or sailed since college. Cassidy was amazing gave my wife and I terrific water ski lessons — we had a blast. No lines either. I also got a great sailing refresher lesson and had wonderful time taking the kids on a hobbie cat. The grounds are huge and spectacular and so are the food and shows. Wonderful staff, every activity we did the GOs were awesome. Also have to give a shout out to the Chef. Our son has peanut allergy and the menu was very allergy friendly. The chef was also very accommodating and explained everything we needed to know. We just got back today from a great week at Club Med Cancún. The stay was perfect from the welcome reception to the well-orchestrated departure. The kids (10, 13 and 15) all had a great time. And, the whole family thoroughly enjoyed the tennis above all. Each day began with a group lesson and ended with a fun and exhilarating tournament. The tennis team led by Javier was amazing. Octavio and Germain worked the morning lessons and tournaments with Javier and ensured all had fun and improved their game. Our kids played in the doubles tournaments and had a blast. The tennis was so good I didn’t even review the beach, pool, food, water sports and other entertainment (all wonderfully arranged by Sydney) which were all great as well. We’ve been to many Club Med vacations (Sandpiper Bay, Punta Cana, and Cancún) and this was certainly one of the best. Aquamarina -- which houses 60 Family Suites -- is perfectly situated at a spot in which the Caribbean Sea and Gulf of Mexico meet. It's also situated on a quiet beach that's never crowded, and is supervised by lifeguards during high season. On the other side of the resort, a bigger stretch of shoreline fronts Hotel Zone, with a postcard-perfect view of the Gulf. You can really find a spot to dig your toes in the sand just about anywhere though. There's a large, circular pool -- known as the Main Pool -- in the center of the resort. It offers basketball nets for pool games, and many fitness classes are held here; lifeguards also supervise the pool during high season. The best pool, however, is located in Jade, and is exclusive to guests who stay in that facility. 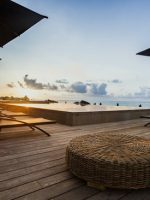 It offers private cabanas, loungers and infinity elements -- the pool practically pours into the ocean -- but doesn't feel kid-friendly (even though Jade offers family-specific rooms). Luckily, kids enjoy their own pools via separate children's facilities and programs. 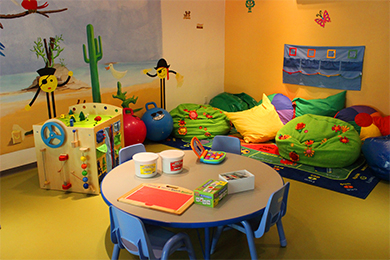 Opened in 2014, Petit Club Med caters to ages 2 and 3 with a play room; nap room; pint-sized, shaded pool and "baby gym." While parents are required to provide diapers and formula at Petite Club Med, GO's (Gentle Organizers) take care of all matters in designated rooms. Petit Club Med is open 9 a.m. to 5:30 p.m. daily, except Saturdays when it is closed for cleaning. Children who are between 4 and 10 years old are placed in Mini Club Med, where they enjoy a swimming pool of their own -- complete with a sliding board (added in 2014) -- along with arts and crafts, games and more. Mini Club Med is open daily, 9 a.m. to 5:30 p.m., and then 6:30 to 9 p.m.
Club Med Passworld -- which takes on a car theme at Passworld Car Wash -- is geared for the 11-to-17 set. The front portions of real Volkswagon Beetles line the room, providing funky places to sit and relax. There's also a boxing ring in the front of the room -- kids jump on it like it's a ball bounce. And metal drums -- the kind you see in service stations -- function as tables. At these, 'tweens play Connect 4 while others throw their chips in for a lively game of poker. Computers are also available. Flying Trapeze School -- exclusive to Club Med -- is not to be missed. 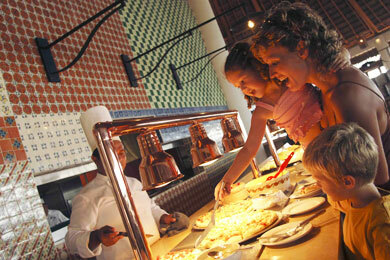 Plus, Club Med Cancun Yucatan provides special morning hours just for kids. How It Works: All guests are set up with a secured harness and given brief instructions (and courage) for use of the trapeze. When it's your turn, you'll climb a thin ladder (probably the scariest part for those who fear heights) to a platform, where an instructor will carefully hook your harness to another contraption, controlled by another [very strong] instructor below. You'll then be launched into the air as the instructor below calls out instructions -- follow the commands and enjoy! Club Med Cancun Yucatan touts the second largest coral reef in the world, and snorkel gear is complimentary to all guests. If you've never been windsurfing, sailing, or kayaking, lessons are available daily (except on Monday and Thursday afternoons) with reservations; reserve in as much advance as possible. Tip: If you've been windsurfing before, or are with someone who has, notify the staff and you'll likely be able to get out on the water without a reservation. The entertainment at Club Med Cancun Yucatan is absolutely stellar. On Saturdays, trapeze artists, acrobats, and fire dancers put on a spectacular display, which concludes with fireworks and a party that goes late into the night (Saturdays are also White Nights, when guests are encouraged to wear white). The Maya Lounge, added in 2014, also offers entertainment, though it really lacks in comparison. Appropriately named Comfort Zone, the spa at Club Med Cancun Yucatan offers a typical array of services, such as massages and facial treatments. It also has a Teen Spa, with deep-cleansing facial treatments for acne-prone skin, plus hand and foot massages and manicures and pedicures. The spa is open 9 a.m. to 8 p.m. daily; schedule your appointment in advance. Additional fees apply. Tennis lessons are available to to all guests; kids must be at least 11 to participate. Classes are divided into three categories: Beginner, Intermediate and Advanced. Private lessons are also available, and daily tournaments take place at 5 p.m. (and 9 a.m. on Thursdays). Club Med Cancun Yucatan offers opportunities to safely leave the resort and visit popular points of interest, such as Tulum and Chichen Itza. 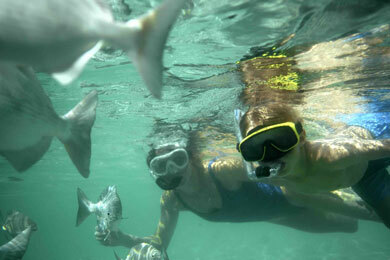 Other experiences include swimming with dolphins or turtles, and exploring "cenotes" -- natural sinkholes. Additional fees apply. If you're interested in renting a car during your stay, the resort can assist with arrangements. Club Med Cancun Yucatan offers exceptionally good food at three restaurants: La Hacienda, Las Cazuelas and La Estancia. Essentially the main dining area, La Hacienda serves a delicious spread for breakfast, lunch and dinner. It also offers a Baby Corner (one of the brand's signature offerings), complete with assorted formulas, pureed food, yogurt and a blender for self-use. Bibs, bowls and high chairs are also provided. Better yet, La Hacienda offers a "Baby Food of the Day" -- a specialty puree that might include beef, zucchini and potatoes, for example. Note: It closes at 2:15 p.m. in preparation for dinner hours. If you're hungry for a mid-afternoon snack, head to Las Cazuelas, where lunch is served until 4 p.m. Breakfast is served 7 to 10:30 a.m., lunch is served 12 to 2:15 p.m. and dinner is served 7 to 10 p.m. Similar to La Hacienda, Las Cazuelas serves breakfast (7 to 10:30 a.m.), lunch (1 to 4 p.m.) and dinner (7 to 10:30 p.m.) by the water. It's located just steps from Aquamarina, making it an ideal choice for families. Tip: Try the Chocolate Bread. The chain is known for the White Chocolate Bread, but the Dark Chocolate Bread is just as good, if not better. The bread -- which can also be found at La Hacienda -- is so good and so famous that you can actually request a recipe to take home! Opened in 2014, La Estancia is a reservation-only, oceanfront restaurant. While it's ideal for a date night, it still welcomes families with a casual atmosphere (you won't find chicken fingers or grilled cheese on the menu though). An Argentinian grill, La Estancia specializes in steak -- though it's the empanadas (flavors rotate daily) and creme brulee that truly stand out. Brunch (10:30 a.m. to 12 p.m.), afternoon appetizers (4 to 6:30 p.m.), dinner (7 to 9:30 p.m.) and late-night snacks (10 p.m. to 12:30 a.m.) are served. All rooms are equipped with U.S. outlets, though many rooms only provide European outlets in the bathrooms. Wi-Fi is available for an additional fee, and works well in guestrooms. We've found that it doesn't work as well in common areas, however. Soluna, Las Velas and the newly added Maya Lounge offer cocktails for parents; Las Cazuelas also has an impressive lounge by the water. In-room babysitting services are available, though Pyjama Club Med is the best option in terms of rates (when parents have nighttime plans, that is; daytime programs are included in rates). It's hosted at Mini Club Med for kids between 4 and 10 years old. Aside from a fitness center, the resort offers fitness classes and programs for every age bracket and skill level (part of all-inclusive rates). High season includes holiday periods, such as Christmas, New Year's, Presidents Week, Easter and Passover, plus the month of August; low season covers May to July and September to October. While September and October are nice times to visit, be aware they're part of hurricane season, and chances of rain or relentless humidity are imminent. 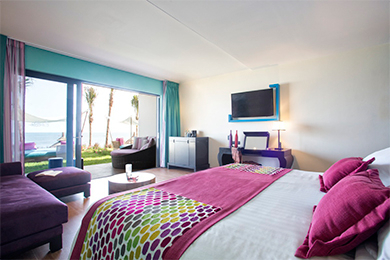 Club Med Cancun Yucatan -- located at the end of "Hotel Zone" -- is a 20-minute drive from Cancun International Airport. Typically, Club Med Cancun Yucatan is the first stop for airport vans carrying guests to Hotel Zone properties. 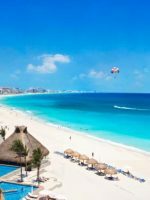 Tip: Before arriving in Cancun, we suggest you book a transfer package. If you haven't, buy transfers from one of the many tourism-related vendors who try to corral you as you walk from the airport's baggage claim to the street. Once on the street without a voucher, you can fall prey to some greedy taxi owners. Tip: Consider booking your flight via Club Med -- you'll receive complimentary shuttle service to and from the airport (a driver will wait for you upon arrival and pick you up for departure). The resort is so expansive, you'll want to take advantage of the complimentary shuttle service offered. The shuttle runs a constant loop between reception and Las Cazuelas (with stops along the way -- just request where you'd like to go). While your youngsters play at one of the resort's kids' clubs, head to the Comfort Zone for a Comfort Touch Signature Massage (60-minute, full-body massage) or try a salsa lesson and cocktails at Soluna; lessons are offered at 10:30 a.m. and 4 p.m daily. Afterward, enjoy a quiet dinner at La Estancia.